It’s impossible to abandon the need that exists in me for the raw wildness of the mountains, the high country, cascading streams that haunt and soothe, and their mercurial trout. I’m absorbed by these places, where solitude is rich, you can sense the pulse of life. I like to fish alone, not always, just occasionally. There is a stream in the southern Drakensberg that I try and fish a couple of times each season, mostly spending a few nights camping with a couple of fishing buddies. But occasionally, I roll out of bed long before the sparrows make an appearance and spend a long day on my own. The Mkhomazi is nestled in a beautiful, wide valley in the foothills of the Drakensberg below Southern Africa’s highest peak Thabana Ntlenyana, (11,424ft) just across the border in Lesotho. It is a challenging stream with a fairly sparse population of brown trout. They can be picky – often. I have had more blank days here than any of the other Berg streams. Recently, I made the long and winding trip, leaving home in the dark with a 3-hour or more, drive ahead of me depending on the condition of the 70 odd km of dirt road. It wasn’t until I crossed the bridge over the Inzinga that the first signs of light began to tinge the eastern horizon. Out to the west the sky is pulled down tight over the worn, dark ridges of the great Drakensberg escarpment, rising ghost-like out of the misty lowlands and deep valleys. But, by the time I’d parked at the low-level causeway on the reserve road, ominous and threatening blue, black clouds had spread across the high peaks. There was now an urgency to get onto the water, to stalk a large trout I’d seen on my visit at the close of last season. It was in a long shallow run about 500 meters upstream – hopefully he was still there, hard against the bank in the shadow of the overhanging tussock grasses. Trout appear and disappear, affirming the wild rhythms of possibility and tendency rather than certainty. They don’t disappear as much as fade, dissolve and then unannounced reappear at will – shadows of motion and colour. In the run above the bridge I had a small brown come up and nose the hopper. On the next cast less circumspect, duped by the fraudulent alluring fly, he boldly sipped it in. A plump, 12 inches, as pretty as they get – it felt like a good omen. But, for the next hour with one eye on the approaching weather, all went quiet. Then, just below the ‘big brown’ run in a deep pool of light and shadow, littered with large ash-grey boulders, I was surprised by a solid, 18-inch trout that was tempted by the weighted #16 nymph hanging below a bushy CDC and Elk. He was strong and fought hard for freedom, but lost. I held him for a moment to admire the beauty, then with a flick of his tail he was gone, back into the shadows of the pool again. The weather was changing fast, squall after squall swept across the escarpment, I could feel the cold wind against my face, rain was coming. It was time to move upstream. I reached the knee-deep run, its pale green waters flowed steadily, the bottom strewn with stones, the surface riffled by the wind. A deeper channel and current seam hugged the right bank below the overhanging tussock grasses. Keeping low, I moved cautiously, wading slowly hard up against the left bank, searching. A shadow moved just off the current seam, was it the ‘big brown’? I’d changed back to the hopper. The first cast was off to the left, the next the same – I was rushing, a deep breath and the third cast landed perfectly, I saw the shadow move again as the fly drifted past, but nothing. The weather was almost overhead, thunder and lightning were all around – too close for comfort. Just a few more casts and I needed to get back to the protection of the vehicle. Then for the third time I saw the shadow against the bank a second before he rose to the fly. I clumsily struck, i felt the weight and pulse of life in the cork, a momentary pirouette as it broke the surface. He turned and made a dash downstream. I followed, but he had wrapped the light 6x tippet around roots in the undercut and was gone. I don’t know if it was the ‘big brown’ – it was a really good fish. For a stream that has on occasion produced just two or three fish for three anglers over two days including a few blanks, this was a good day on the Mkhomazi, all in the space of a few hours. It was time to go. I reached the car soaked to the skin. There was little chance of the rain easing up soon. So, after a slow, slippery drive back along the gravel section, a stop for a legendary pie (I like the pepper steak) and coffee at the Windmill Ultra Stop outside Notties, I was back home by late afternoon. 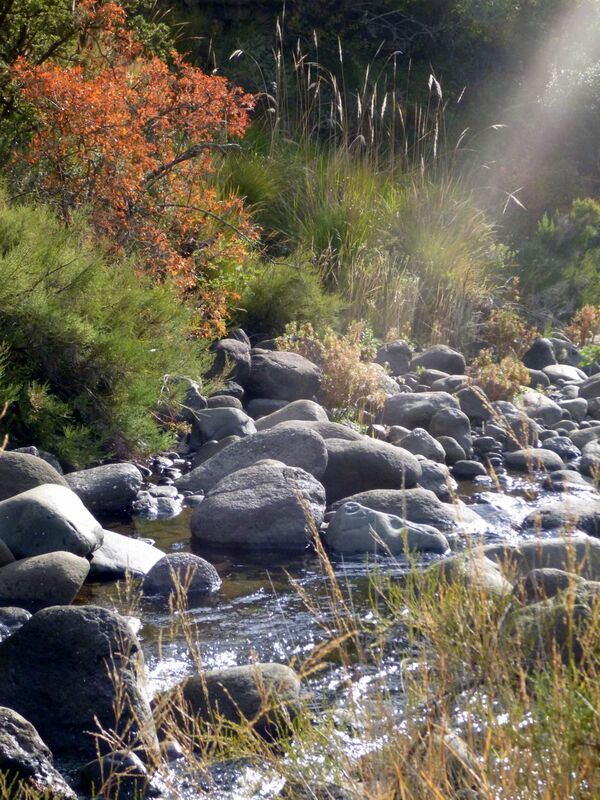 I will return to the high country, to the sparkling streams and their trout – and, for another try at the ‘Big Brown’. ← TYING THE WOLF SPIDER. Basically every day I come home from work (You know some of us are not on pension yet) and sit in front of my vice. That is the place where I get to dream about small streams, Brown’s and be at peace with myself. Thank you for letting us see that Brown of yours trough your eyes. It is the stuff I dream about every night.